DAVID CHAPMAN gave possibly a final public reminder of his talents with success in Tuesday’s Halifax-Huddersfield Alliance at Crosland Heath. “Chappie”, who is to retire shortly after a lengthy spell as Outlane professional, shared the pro-am honours in bright but cool conditions. He and 15 handicapper Brian Moroney carded 42 points, a score matched three hours later by Dewsbury assistant James Ward and Longley Park’s scratch amateur Matthew Colcombe. Chapman had been a regular player in the winter Alliance fixtures up to recent times. He is handing over to Rob Booth at Outlane. The lead in the am-am kept changing hands with home club pair Ray Owen (15) and Richard Gledhill (14) finally emerging victorious with 44 points. Heath also took second place on countback after two pairs scored 43 points. 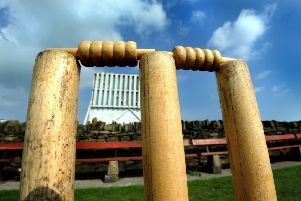 Andrew Lawton (8) and Chris Moorhouse (9) got the verdict over Meltham’s Peter Garlick (4) and Damon Hansom (4). Nearly all the holes were played from the summer tees although the greens were still very soft. The course was in very good condition for mid-February and this was reflected in the scoring. Dewsbury and Meltham are joint leaders in the club championship with 211 points and Ward has taken over from Dewsbury’s Nigel Hirst at the head of the Pro Order of Merit. Pro-am: 1 J.Ward Pro & M.Colcombe scr Dewsbury/Longley Pk 42; 1 D.Chapman Pro & B.Moroney 15 Outlane 42; 3, R.Lambert Pro & A.Taylor 10 Crosland Heath 41; 3, D.Astin Pro & T.Tighe 14 Elland 41; 5, T.Pollard Pro & S.Sandie 7 Bradley Hall 40; 6, D.Delaney Pro & P.Caldwell 11 Bradley Hall 37; 7, G.Moore Pro & R.Tolson 9 Hanging Heaton 33; 7, J.Fish Pro & F.Johnson 12 Meltham 33. Am-am: 1, R.T.Owen 15 & R.Gledhill 14 Crosland Heath 44; 2, A.Lawton 8 & C.Moorhouse 9 Crosland Heath 43; 3, P.Garlick 4 & D.Hansom 4 Meltham 43; 4, I.Wallis 8 & P.Pither 11 Crosland Heath 41; 4, J.Crossland 13 & R.Garside 10 Meltham 41; 4, P.Ledgard 15 & R.Matthews 6 Dewsbury 41; 7, T.Hellawell 12 & J.Wozniak 11 Meltham 40; 7, E.Pearson 18 & M.Russell 20 Crosland Heath 40; 7, S.Spencer 16 & E.Dougherty 14 Outlane 40; 7, N.Leader 10 & D.Hallas 8 Meltham 40; 11, B.Minto 11 & S.Minto -1 Hanging Heaton 39; 11, O.Shaw 5 & O.Hague 11 Crosland Heath/Bradley Hall 39; 11, P.Marsland 14 & G.Proctor 10 Crosland Heath 39; 11, S.Hitchenor 8 & A.Wallis 9 Crosland Heath 39; 11, G.McLean 1 & M.Dobson 7 Meltham/Ind Huddersfield 39; 16, J.Smith 13 & A.Mellor 12 Longley Pk/Outlane 38; 16, C.L’Estrange 12 & G.Newton 7 Crosland Heath 38; 6, N.Sutton 6 & S.Beaumont 5 Outlane 38; 16, J.Lawton 4 & B.Ashton 12 Outlane 38; 16, D.Hartley 1 & A.Johnson 3 Dewsbury 38; 21, D.Knapton 14 & N.Hirst 11 Outlane 37; 21, P.O’Flynn 13 & C.Twigg 12 Outlane 37; 21, P.Heywood 9 & B.Lawson 15 Marsden 37; 21, A.McMahon 6 & A.Bennett 12 Dewsbury 37; 21, R.Speight 5 & F.Speight 10 Dewsbury 37; 21, J.Binns 4 & S.Atkinson 2 Dewsbury 37; 27, R.Berry 12 & J.Garlick 7 Meltham 36; 28, G.Thornton 20 & L.Carmen 10 West End 35; 28, J.Smith 12 & T.Birkhead 7 Dewsbury/Meltham 35; 28, S.Whitham 11 & R.Wimpenny 12 Crosland Heath 35; 28, B.Thomson 11 & A.Kendall 21 Crosland Heath/Longley Pk 35; 32, C.Froggett 18 & B.Page 18 Bradley Park 34; 32, D.Blackburn 4 & J.Blackburn 13 Dewsbury 34; 34, J.Horner 18 & M.Horner 23 Dewsbury 33; 34, M.Myer 12 & M.Turner 9 Dewsbury 33; 34, E.Casper 10 & J.Morris 20 Outlane 33; 34, G.Hollingdrake 6 & B.Workman 17 Bradley Park 33; 34, M.Maude 4 & G.McMahon 5 Meltham 33; 39, A.Hirst 15 & P.Pitchforth 14 Bradley Hall 31.